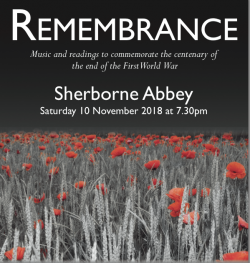 THE centenary of the end of the First World War will be marked on the eve of Remembrance Sunday at Sherborne Abbey by Sherborne Chamber Choir, with an evening of music and words in memory of those who gave their lives. On Saturday 10th November, the choir will perform music for Remembrance, in a programme that includes movements from Fauré’s Requiem and Parry’s Songs of Farewell, written during the First World War. Other music includes local composer David Bednall’s setting of Rupert Brooke’s poem The Soldier, Jonathan Dove’s They Shall Rise (commissioned for the centenary service of the RAF in Westminster Abbey earlier this year), anthems by Stanford and John Ireland, and Paul Mealor’s Wherever You Are, the hit written for the Military Wives Choir. There will also be hymns for all to sing and the evening will end with an Act of Remembrance and The Last Post. 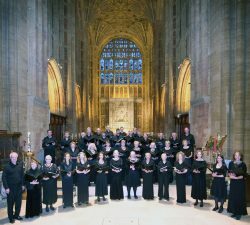 The choristers of Sherborne Abbey Choir will join in for Fauré’s Pie Jesu and other music in this concert, conducted by Paul Ellis with Simon Clarkson at the organ. Readings will be given by Canon Eric Woods, Rector of Sherborne Abbey. Proceeds will be donated to the Royal British Legion Poppy Appeal. For more information, telephone 01935 815341. Posted in The Art of Sound on 5 November, 2018 .